Aditi Chai Launches at Pike PLace Market Sunset Supper! We had a great time launching Aditi Chai at the Pike PLace Market's Sunset Supper on Friday August 17th, 2018. Heartfelt thanks to the many hundreds of guests who shared their good wishes and encouragement with us. Very Special thanks also to our friends Sobia and raj for their tireless help! Aditi Master launches Aditi Chai at Pike Place Market Sunset Supper!! Chai, garam Chai at Pike Place Market! Aditi Chai launch at the Pike Place Market Sunset Supper! We also served Bhel-Puri, a traditional Bombay street food typically eaten out of rolled up newspaper. We used new compostable bowls! Aditi Chai is an Authentic Masala Tea prepared from concentrate that facilitates retail service of an authentic single cup Indian chai experience. Each concentrate batch is custom blended and scaled by Chef Aditi Master for wholesale purchase and use in cafés. The masala tea is prepared in batches in a small, yet pristine, commercial kitchen just minutes from downtown Seattle. The prized chai recipe has been with Aditi’s family for generations, and has origins in the most "foodie" of Indian cities, Surat. Prepared Aditi Chai is distinguished through its complex multi-layered flavors. Each sip brings with it an anticipatory fragrance bouquet, early and late flavor tones, and a warm feeling as it goes down. The tea is spice-filled, yet not spicy; sweetened though not sweet. Our tea is blended from leaves sourced from the most exclusive Assam tea gardens in India. Our whole spices are selected with the assistance of a distribution cooperative representing Indian growers. These spices are ground for use just as needed to allow maximum flavor and scent expression. We slowly steep these spices with a modest amount of cane sugar and with fresh herbs and ginger root sourced in local markets to build complexity before adding the tea. One delightful consequence of our approach is that each batch adopts subtle characteristics that allow drinkers to enjoy similar batch freshness (variability) to that which occurs when tea is prepared at home. While we deliver a very consistent experience, you customers would not find it natural for every single Aditi Chai cup to have identical taste. "Authentic" is an important word at Aditi Chai. We present and share a genuine chai that is an honest expression of what we prefer to drink at home, and what our family has enjoyed for decades. While all of India may not drink this recipe on a daily basis, Aditi Chai could readily be served on any street corner or in a Prime Minister's or President's home with equally confident standing. There are many reasons that tea is the number one prepared food beverage in the world (number two overall following water!). Search with Google, Bing, Siri, Alexa, or Cortana to see why most people prefer tea. You'll learn that even the rarified group "millennials" prefers chai to coffee. You may need only a sip, a "cutting" (a half cup or glass), or perhaps even one full cup of Aditi Chai to understand why it may be considered the most regal of authentic masala teas. Aditi Chai is supplied as a concentrate meant to be mixed one-to-one with whole milk or alternatives. Traditionally (and perhaps even ideally), the Aditi Chai concentrate would be mixed with whole milk in a saucepan and brought to a rolling boil on the stovetop. In this instance, there may be a very delicate suggestion of cream (called "Malai") that can form on the top. You are almost expected to blow that cream away as you cool the tea to sipping so that you don't get it stuck in your mustache! In a commercial settings, the blended masala tea can be heated through a traditional barista steamer, in a microwave, or on stovetop. There are also several commercially available electric milk frothers and steamers into which the entire mix can be added. We do not recommend attempting to create foam, nor do we recommend serving the tea with milk foam for a more authentic experience. In settings where multiple cups may be served on short order, you may place the chai/milk blend in a glass carafe on old fashioned coffee pot warmer. 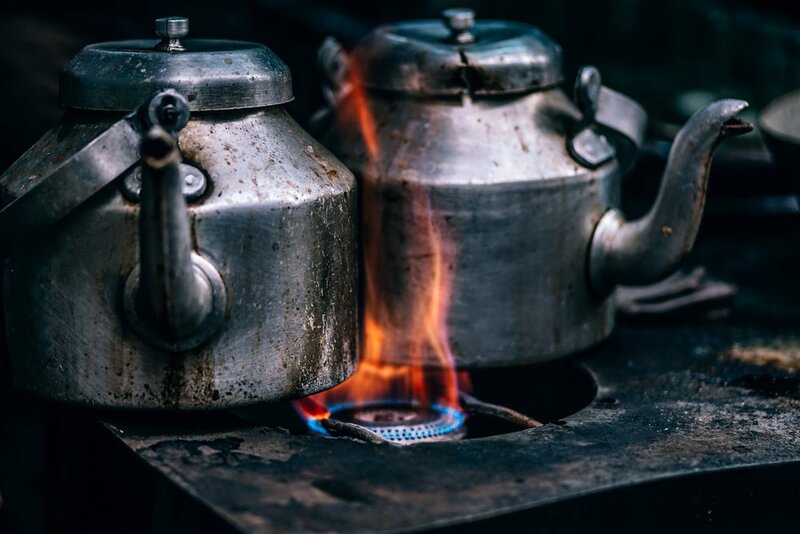 For even larger volumes, a percolator on warm setting can keep even more tea ready at a comfortable serving temperature for longer periods as food safety standards allow. Non-dairy alternatives such as coconut, hemp, soy, rice and surprisingly "pea" milk are great alternatives to whole dairy milk. Again, we recommend versions with some fat for best flavor and buzz. Those who like their tea "strong and sweet" can choose to add one more tea-bag and a 1/2 to one teaspoon of sugar per service just as tea concentration is brought to boil. Aditi grew up in Bombay (now Mumbai) and had the privilege of living in a joint family with her grandfather, uncles, aunts and parents. Good food and good company always found their way in her home. Aditi's mother and two aunts would go the local Santa Cruz market daily, hand select produce, and prepare fresh meals three times daily. Although she didn’t appreciate it growing up (more on this later), her mother is an exceptional cook. Unknowingly, she had cultivated a palate for incredibly tasty, authentic, fresh "farm to table" food! One of Aditi's uncles is particularly fond of Bombay's rich street food. He would steal Aditi away on his scooter in the afternoon or after supper and take her to eat at his favorite street vendors. Some of Aditi's most memorable memories include plans with her uncle Satish to "eat" (a small) dinner at home and then go out for a “long walk”--which of course, included a stop along the way to either Mani’s dosa stand or Gokul’s for ice cream! Years later, from almost any of the street vendors directly opposite Aditi's college (Mithibai) in the Bombay suburb of Juhu, Aditi found the best venue for eating Vada Pav and Mumbai masala sandwiches! Despite growing up loving food, Aditi was entirely unprepared for the next phase of her relationship with food and local markets. In fact, just before her marriage, her mother warned her future mother-in-love “our daughter has never set foot in the kitchen, so please make sure your son doesn't expect good food”. Moving to Menlo Park, California after their 1999 wedding, Aditi quickly learned that she had better learn to cook if she wanted good food. Even with the many Indian tech workers in Silicon Valley, there was very limited authentic Indian fare available, and only a small grocery warehouse in Berkeley that served street food in one corner. Aditi's mother-in-law is also an exceptional chef, as is Aditi's grandmother-in-law, and Aditi quickly started collecting their recipes and techniques. She integrated the best from several family recipes and Aditi made each dish her own. Soon she was not only cooking her childhood favorites, but exploring global cuisine. Local markets and global cultures with diverse cuisine again played a more prominent role when Aditi and her husband moved to Basel, Switzerland. Every day, farmers would pick produce in the early mornings to be sold in the “Markt Platz” (Market Place, Basel's central square). She learned the value again of daily produce selection and of meeting and speaking with the vendors and trusting their recommendations. She met local bakers from the coffee shops around Basel and from travels in Europe. Whether a meal from a neighborhood cafe, or from a Michelin-starred Chef, culinary experiences opened up a new world to Aditi and sparked further culinary interest. The bounty of fresh Pacific Northwest produce further inspired Aditi when she moved to Seattle in 2005. She had little insight she would enjoy her culinary journey so much, and would actually become so passionate about cooking and entertaining! Along with her husband, she carefully tended a small vegetable farm on a small one-acre plot in Yakima County, east of the Cascades. One year the garden yielded 1000 tomatoes, and another year, her husband brought home 200 "Hungarian Hot" goat peppers hand picked by him from their favorite Krueger Pepper Farms. Aditi was forced to learn what real farm-to-table really meant. Aditi was in heaven with so much fresh produce that she found herself volunteering to cook for family and friends for any or no occasions!! Her popularity as a chef grew among friends and family, and by popular demand, she and two other friends started a “pop up series” under the name Cilantro Sisters. Their first event was a sold-out plated seven course meal at the Pike Place Market's Atrium Kitchen, and the Cilantro Sisters continue to serve innovative cuisine around the Seattle Metro area through regular pop-ups. Aditi and her husband are long time supporters of their local Mercer Island Farmer's Market, where they regularly meet long time friends from Mercer Island, the Puget Sound, and the Yakima Valley. Aditi has started making her signature Aditi Chai available commercially to bakeries and coffee shops in the Seattle metropolitan area. Complete the form below if you'd like to join other local cafés and bakeries in serving authentic masala tea! Interested in Serving Aditi Chai? Please leave us a note below and we'll get back to you in a "cutting!"